The Fort Smith Downtown Business Association (FSDBA) presents 3rd Thursday. 2019 3rd Thursday events beginning April 18, 2019. They will run thru the month of October. 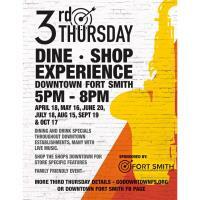 3rd Thursday will be held from 5pm to 8pm and is brought to you by the Fort Smith Downtown Business Association. The event will be held "Along the Avenue" and includes the neighboring streets. Parking is FREE downtown after 5pm. experience Downtown Fort Smith. Enjoy dining and drink specials throughout Downtown establishments, many with live music. Shop the shops for store specific features during this family friendly event. Look for "Pop-Up" shops up at the former C&H Tire location and down the avenue with artists, shopping and information. Beginning in MAY, the Park at Westend will offer FREE rides for 12 & under (if in operation) from 5p-8p (compliments of General Pallet). generous sponsors. The "Indian Territory Pistoliers" will be robbing the trolley as it makes it way around downtown.